Today is the first day of a four-day event for police departments all over the US to come and honor their fallen, participate in a conference, and have a good time in our fair city. 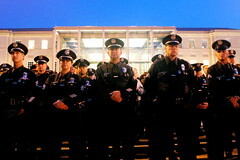 Tonight, there will be a candlelight vigil at the National Law Enforcement Officers Memorial at Judiciary Square. Friday and Sunday, there will be a National Police Survivors’ Conference, which might just be the very worst named conference ever, given the trend for Police across the country to militarize and conduct dog-killing drug raids. There will also be a Memorial Service at the US Capitol for Peace Officers on Saturday. Be mindful that the Police are always welcome in our town, but it would be appreciated, officers, if maybe you wouldn’t pull the fire alarms and engage in drunken debauchery in our town? It would be a bummer to throw the country’s finest in our jails.